A customer ran into this recently and suggested I post it on my blog. He even let me use his screen shots! (Thanks Joseph). The problem was that after importing some existing VMs it was noted that the Action Items available were limited to just a few selections. Upon examining the screen shot, you may notice (if you look REALLY hard and use your imagination - sorry about the quality of the screen shot) that the machine's state is "Machine Provisioned" and there are only 3 actions available (Edit, Destroy, Expiration Reminder). You may notice that the STATE of the machine dictates the available items in the Actions menu - obviously you can't RDP to a powered off server, for example. Thus, the limited action items were correct, but what was not good was the hung "Machine Provisioned" state for an imported VM. What had happened here is that the blueprint had a custom workflow stub set up for provisioning and since the existing VM didn't have the guest agent installed, so the workflow just waited. 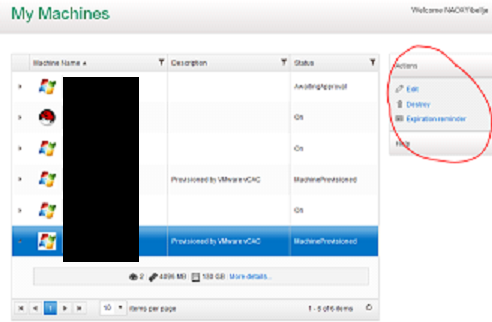 To avoid any problems like this when importing unmanaged VMs into vCAC, VMware recommends creating a new, clean, simple blueprint - you can always customize the blueprint later if needed with lease times, archive times, workflow customizations (think about adding a disposing custom workflow to simplify decommissioning these existing VMs later). But for the initial import, keep it clean! Also, be aware of any custom properties which kick off provisioning workflows associated with build profiles, reservations, provisioning groups, etc as these can also impact your import.